Weight: 18 lbs, 15 lbs, 14 lbs. Favorite toy: Plastic Ice cream Cone, Stuffed Fur Ball, Fur Duck. Favorite activity: Angel- sqeaking toys. Annie- Eating. Jasmine- Hunting. Special talents: All 3 Girls Have WON my heart! 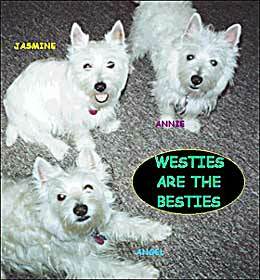 They have their own Westie Club! Most embarrassing moment: Angel's- Jumping Annie. Annie's- Pooping on carpet. Jasmine- Getting loose in the store. Most trouble I ever got into: Angel- Eating fiberglass insulation. Annie- In the tub. Jasmine- Fighting. My favorite friends: The 19 pets the girls live with, birds, rabbits, lab, giunea pigs. Biggest adventure: Going to the park and down the slides! Also sled riding!